Here's a 'fresh' design, for composters! The RolyPig composter is the easy and fun way to make compost. Compact and completely enclosed, the RolyPig Composter aerates effortlessly and continuously for faster decomposition. New waste is "fed" via the RolyPig's snout. When the first compartment is full (about 3 weeks) you roll your RolyPig onto its next two flat sides, aerating all the contents automatically. Simple, back-saving, and no complicated mechanisms. 12-15 weeks later, your plant-friendly compost appears from (you guessed it) your RolyPig's. 'bottom'. Because material flows from one internal compartment to the next and finally into the rear discharge drawer, the RolyPig never becomes full. 'What makes the RolyPig Composter Special', you ask? Patent-Pending Continuous Flow System The first of it's kind, these patented designed continuous flow chambers mean no more compost batches. You can feed your RolyPig every day. Four compartments, designed with paddle deflectors, enable this screw design to work with gravity to process your waste cleanly and efficiently. Effortless Cycles No more batches After about 3 weeks of feeding RolyPig , the first compartment will be full, and you roll RolyPig to move the waste from the first compartment to the second compartment. After 12-15 weeks the original waste will be in the last compartment, and you can remove the from the (you guessed it) rear bucket. The compost should be ready, but if not, just feed it to RolyPig and run through the Continuous Flow System again. 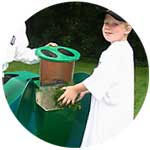 Children Love Feeding the RolyPig Your children will be enthusiastic about taking kitchen waste to feed RolyPig. RolyPig is (no way around this) cute and because of its size conjures up an image of a lovable farm yard animal. Every time your children see RolyPig, chances are they will smile. You will too. Children treat RolyPig like a new pet. While it is not a toy, children genuinely enjoy feeding RolyPig because it is a clean, easy, and fun chore. Turn Your Kitchen Waste into Garden Gold Never again will you dump organic kitchen waste into the garbage to be expensively transported to the landfill site where it would be expensively monitored for years to come. Just think how much fossil fuel energy is wasted in this way to bury a potentially useful garden fertilizer. 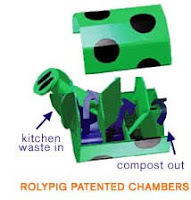 Completely Enclosed Pest free Unwanted pests can’t get at kitchen waste in the RolyPig Compster. The design of RolyPig’s fiberglass head and rear bucket do not allow for pests to get at the vegetable waste. The head needs to be lifted in order to feed RolyPig. While a child can do this easily, it’s much too heavy for pests to move. The fiberglass rear bucket is designed to fit snuggly so pests cannot enter RolyPig from either end. Many cities now ban or are considering banning open compost piles because of the pest control (e.g. rats, mice, raccoons and insects). The RolyPig allows residents of these area to continue composting. Durable Materials & Five Year Warranty Made of high quality lightweight materials. RolyPig Composter has been manufactured using the highest quality, long life, UV protected plastic and hand crafted fiberglass. These pieces are bolted to aluminum struts which give RolyPig strength and long lasting performance while keeping RolyPig relatively light and easy to move. This composter carries a 5 year warranty! How Do I feed by RolyPig?? Although the Rolypig will work satisfactorily when fed organic matter of most types, best results are obtained by observing the following tips: Wet But Not Soggy :: Moisture & Microbes 101 The most effective microbes for converting organic wastes to high-quality compost are aerobic microbes. "Aerobic" means they consume oxygen. A soggy compost pile does not have enough oxygen to support your microbes. A long way of saying, add your kitchen wastes "wet but not soggy" and you will have active microbes (which also prevent foul odors). Not sure what "wet" means? Think lightly moist, like a wrung-out sponge. Soak up excess moisture in your kitchen waste bucket by placing a layer of torn-up newspaper or even computer paper in the bottom of the bucket and empty this newspaper into the Rolypig with the rest of the waste. Conversely, excessively dry materials should be well wetted. Chop chop chop: For Faster Microorganisms Digestion Chopped or shredded material will degrade much quicker. Adding unchopped whole fruit items or sticks of wood will slow digestion. (sawdust when wetted is fine) Mix any large lots of any one kind of waste (i.e. lawn trimmings) with other more structured waste to aid aeration. For example, larger amounts of lawn clippings can be well utilized by temporary stacking and then feeding to the Rolypig over a more extended period to produce useful compost. Other wastes: The Rolypig Composter will compost newspaper and large paper based directories when shredded or torn up and thoroughly wetted then mixed in with normal kitchen and garden waste. This is a good way of retaining the plant nutrients present in newspapers and directories for use in your garden. Additives: Give nature a little boost Give your RolyPig a good start by introducing the microbes necessary to begin “cooking” your compost. This can be as simple as adding some aged manure or good topsoil with the first few feedings of raw materials. Other good nitrogen-rich starters are aged manure, alfalfa meal, cottonseed meal, or blood meal. These will help jump-start the microbes responsible for breaking down organic matter into compost. Add hydrated lime to maintain a neutral pH for best digestion and low odor. Lime is also highly desirable in the composting process to reduce disease spread. Earthworms: Red earthworms, commonly inhabit composters under favorable conditions. These worms are normally present in your garden. Specially reared earthworms can be introduced and may have a beneficial effect on the quality of compost produced and also may speed up the process. Such worms may not always breed successfully and so an annual top-up of worms will almost always be required. And remember, your kids will love to add the worms! Compost activator can also be added to speed up the decomposition process. 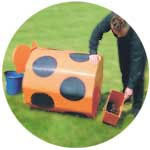 Temperature: Warmer = Faster Place your RolyPig in full sun for faster composting. Keep your compost cooking during the winter by placing in your RolyPig in direct sunlight. If extremely cold weather persists, do insulate the Rolypig with the Rolypig cover blanket (available soon) or hay bales, as this helps maintain correct temperature.